The emotional beauty of this Bangalore wedding's video brought tears to our eyes the moment we watched it! The brilliant pictures proved that it was a lot more as well. The Sangeet night was a fun-filled affair with a ton of performances. We loved the quirky props used. The wedding was a little more on the traditional side but even among all the tears, vidai and emo scenes, the abundant happiness was certainly present. Scroll down to see all the wedding moments! 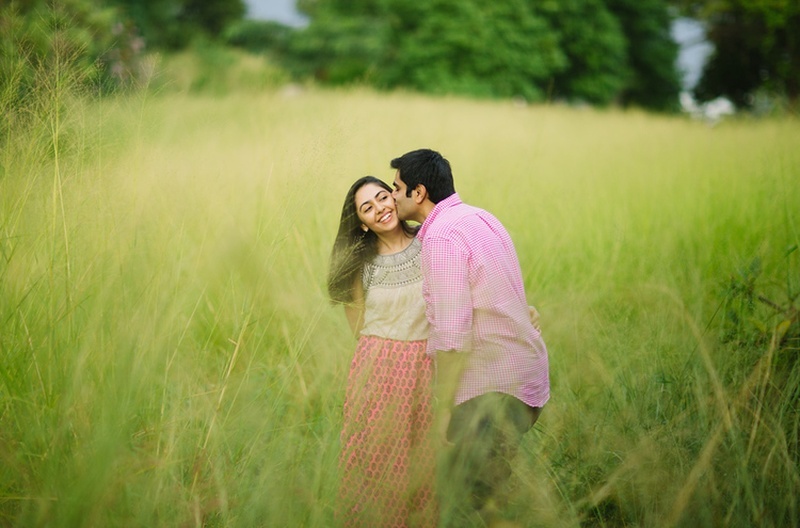 Meha and Vinay’s pre-wedding shoot by Siddharth Sharma took place on an open farm with tons of greenery. He managed to capture some super-cute moments of the couple! They chose to colour co-ordinate in light pink along with a casual vibe. Loved how adorable they looked together. The Sangeet night saw Meha in a yellow and pink lehenga with floral embroidery topped with an elegant and minimal neckpiece. Vinay looked quite smart himself in a black formal suit. There were a number of performances by dancers that added to the fun-filled mood of the event. The wedding at Palace Grounds, Bangalore had Meha looking gorgeous red and white saree, a minimalistic maang-tikka and nath. The intricate mehndi on her hands stole the spotlight. Vinay wore a regal-looking cream and gold sherwani with a red safa and dupatta. The baraat carried colourful umbrella props as he made his entry. The vidai was of course, incredibly emotional but the emotional beauty of it all was palpable.